Unpack the Heart and Soul of "Loving People to Jesus"
Phil ~ Alvin, you have written several very well received books on prayer. Where does this, your latest book, fit with those earlier volumes? Alvin - This book focuses on a certain kind of prayer--prayer that moves pre-Christian people toward a saving relationship with Jesus Christ. Prayer is the means by which divine power is released into people’s lives. When the Bible says “Prayer . . . is powerful and effective,” it means God acts powerfully and effectively through the prayers of his people. When we pray for those in our circles of influence, we release God’s life-changing power into their lives. This book is about praying powerfully and effectively for persons who don’t know Christ. Phil ~ I know you thought long and hard to find the perfect title ... How does "Loving People to Jesus" reveal the heart of your message? Alvin - My hope and prayer in writing this book is that many small groups of believers will be used to love people to Jesus by praying for them, loving them and sharing the good news of Christ with them. Praying, caring, and sharing are all important elements in evangelism. Prayer releases God’s power and grace into people’s lives. Caring builds a bridge of love to them. Sharing makes the gospel clear. But the great goal of it all is to help people who do not know Jesus to come into a new relationship with him. That’s the point I am trying to make with the title. Phil ~ You promote "Loving People to Jesus" as a "Small Group Devotional Study" ... How important is the dynamic of interaction with others to becoming a disciple of prayer evangelism? Alvin - Loving our friends to Christ is something that we can do better together than alone. People working together can achieve results that individuals cannot. A single person can’t lift a piano, but a team of people can. A small group of believers, who team up to love people to Jesus, will do things together that no one of them will likely do alone. Many believers, though fearful of evangelism, will pray, and care, and share the gospel to win people to Jesus when teamed up with others. • All Christians pray; what is distinctive about prayer evangelism praying? Alvin - All good evangelism begins in prayer. To pray for unsaved persons is to acknowledge that only God can change a human heart. It also recognizes that God has chosen to work in this world in and through the prayers of his people. The truth is, things will happen when we pray that won’t happen if we don’t pray. Evangelistic prayer is about prayer that releases God’s power and grace into people’s hearts and lives. It’s a way of co-laboring with God. Prayer seeds the clouds of God’s mercy with the dry ice of love and releases refreshing showers into parched lives. • You talk about "loving care" ... how is a "lifestyle of love" more radical than we typically assume? Alvin - God’s love is the most powerful force in the world. When God’s love motivates our praying, permeates our caring, and activates our sharing, then love becomes radical. When a small group of believers reinforce each other in a lifestyles of love through praying, caring, and sharing, then love becomes even more radical. One log will not fuel a fire. Several logs burning together can fuel a fire--a fire of love. • Sharing has become less tracts-and-telling and more stories-and-questions ... why is that important for us to understand? Alvin - In today’s world “tracts-and-sharing” seem preachy and pushy to most non-Christians. However, when we honestly share the stories of our lives, especially if we are frank about our struggles, that comes across as authentic and is interesting to them. Asking thoughtful questions of our friends and listening with interest to their responses tends to build bridges of love that prepare the way for meaningful sharing. Most “seekers” will open up to people who take a real interest in them. Phil ~ Aftercare, "discipling and enfolding" is also one of your core values. Why? Alvin - Jesus commanded his followers to disciple others and to bring them to full obedience (Matt. 28:20). The Bible also challenges believers to “spur on one another to love and good deeds,” and to “encourage one another” by meeting together (Heb. 10:25). To be spiritually healthy and mature new believers need to be discipled and enfolded into the family of God. New believers, like newborn infants, need spiritually mature believers to come alongside them and to help them grow. • Benefit an individual who cannot work through it with a group? Alvin - A person working through this book alone, instead of with a group, will still benefit immensely from the devotional readings, from the Discover Your Bible verses and reflection questions, and from the Live it Out suggestions. Support and encouragement will come from God and his Word. • Become the basis of a sermon series? Alvin - Almost any congregation will benefit from a sermon series on all or some of the topics that are developed in Loving People to Jesus. Such a series of sermons would be greatly enhanced if private or small group study of the sessions were coordinated with the messages. • Be adapted into a Sunday School class? Alvin - A modest size Sunday School class will certainly thrive on a weekly diet of reading the devotionals, studying the Bible passages, answering the reflection questions, taking part in the share time, and stepping into the Live It Out suggestions. Large classes should divide into small groups for the share and prayer times. • ... Serve Fellowship Group? Alvin - Fellowship is always enhanced when groups of believers reflect together on Scripture, share the realities of their personal lives, and pray together. Larger fellowship groups will find the Loving People to Jesus material most helpful if, for some of their time together, they divide into smaller groups. • Be utilized in a discipleship setting? 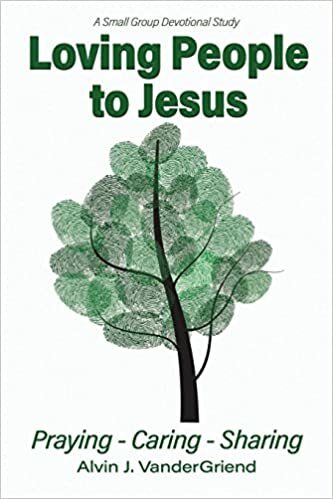 Alvin - Take a look at the thirty-seven topics covered in this book and you will see that they are the kind of topics that will help believers grow in likeness to Jesus Christ. To grow in likeness to Christ is to be discipled. Alvin - Loving People to Jesus is not a sit-down and read-it-through book. The introductory How to Use This Course pages will help group members find the best way to prepare for each session, to know how to use their time in the weekly sessions, and to live out God’s life plan in the days between meetings. Alvin - There are many things in our lives and in our world today that can distract us from the worthy goal of praying for, caring for, and sharing the good news with people who don’t know Jesus. Loving People to Jesus groups are encouraged to regularly read aloud the Group Covenant and the Common Disciplines. This really helps to reinforce the group commitments and achieve their common goals. Alvin - The six core values on which the course is built are all biblical values. Each one of these values is vital to the Christian life and to building Christian community. Readers are reminded by the Core Value statements that the venture on which they are embarking is truly biblical and is incredibly important to God, to them, and to the communities to which they belong. Alvin - Biblical Ways to Pray for Seekers is a page in the Appendix with six Bible passages that bring to light what God is doing to bring non-believers to himself. Those who pray these verses will not only be praying Scripture, they will be praying for what is on God’s heart. These will be prayers “in Jesus name;” prayers that claim the promise Jesus made in John 14:13 when he said that he would: “do whatever you ask in my name, so that the Son may bring glory to the Father.” When Jesus “does what he promised to do” in response to prayer things happen! Alvin - One of the great ways to discover the Bible is to read and reflect on a group of Bible verses that focus on a specific topic. Loving People to Jesus gathers the Bible verses that focus on thirty-seven biblical topics. The Reflection Questions that follow each set of Bible passages are there to help readers discover the truths imbedded in those verses. Alvin - The “Knowledge” we get from the Bible is meant to be experienced as well as conceived. It’s all too easy when studying the Bible to appreciate an idea and then walk away and do nothing with it. The weekly Live It Out prods suggest ways to transpose the ideas we have gained from the Bible study into real-life. Phil ~ What is your hope for those who read "Loving People to Jesus"? Alvin - My hope for individuals and groups using Loving People to Jesus is that they will be transformed by the Word and encouraged to pray for, care for, and share the gospel in ways that will transform the lives of others in their spheres of influence. Phil ~ Alvin, please lead us in a prayer of dedication to express our Lord's love through a Prayer-Care-Share life. . . .
Alvin - Father, you have blessed us richly through your Word. You have transformed our lives through your Son and your Spirit. Others have prayed for us, cared for us, shared the gospel with us, and helped us grow in Christ. You have blessed us so that we can be a blessing to others--those in our circles of influence. We dedicate ourselves Lord, as your faithful servants, to be channels of your grace to those around us: to pray for them, to care for them, and to share the good news of your saving grace with them as you open the doors opportunity. Let your love flow to us and through us Lord Jesus, so that many may come to know your saving love and grace. We pray this Father, knowing that you are the Father who eagerly watches for prodigals to come home. We pray this to you Jesus, knowing that you are the good Shepherd who rejoices when lost sheep are found and brought home. We pray this to you Holy Spirit knowing that you are the one who empowers us to be witnesses for Jesus Christ. Amen. The idea of loving people to Jesus really resonates! I just attended a Worldview conference at my church here in Knoxville, TN. One of the points that the speaker made was that "loving" someone in our culture has come to mean "accepting" them, regardless of what they believe, practice, etc. Acceptance - and acceptance alone - has become the definition of love. This is not Jesus' definition. Indeed, he met people where they were, but he loved them way too much to leave them there. He taught, challenged, convicted - whatever it took to help people see the Truth - which, of course, was Jesus Himself. Starting with prayer for God's conviction and calling of people to Himself - that is indeed the beginning of love!